EVA Air currently operates three flights a day from Los Angeles to Taipei. On Tuesdays and Thursdays, the morning flight, BR5, is the Sanrio Hello Kitty “Hand in Hand” Boeing 777-300ER flight. If you’re a Hello Kitty fan, this branded flight will be a special treat for you. If you are not, don’t worry. This flight will still offer a wonderful economy class experience with a spacious seat, good food and great amenities. At LAX, EVA Air operates out of the Tom Bradley International Terminal. The check-in counters open three hours prior to the scheduled departure time. Upon check-in, you will be issued a very cute boarding pass printed on Hello Kitty card stock. For business class and Star Alliance Gold members, you will have access to the Star Alliance Lounge for your pre-departure lounge services. The Star Alliance Lounge is one of my favorite business class lounges in the entire Star Alliance network. 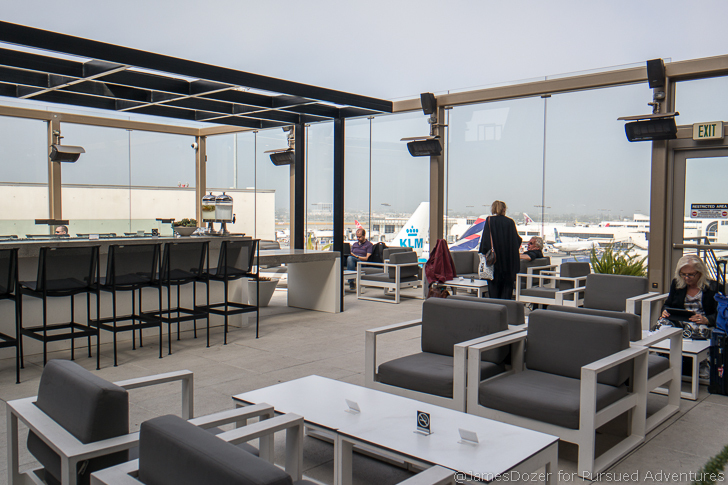 The lounge offers quality food and beverage options and a beautiful outdoor deck to enjoy the California sunshine. 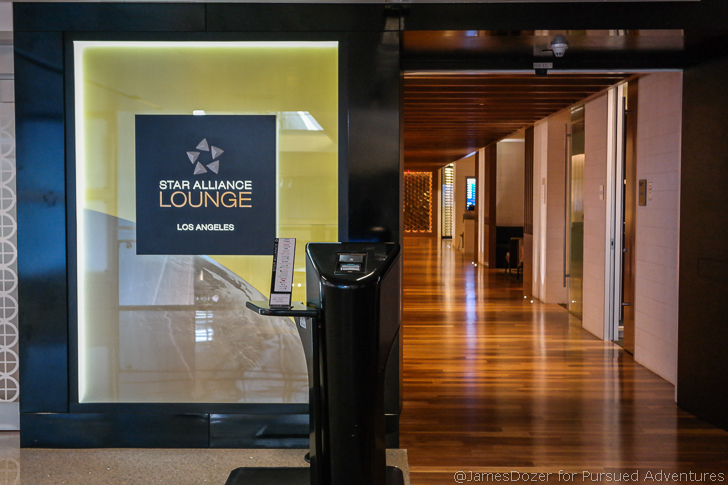 You can click here to read my full review of the Star Alliance Lounge at LAX. EVA Air operates four different configurations of these Boeing 777-300ERs. This specific aircraft, version 1 on Seat Guru, is configured with three classes of service: business, premium economy and economy. At the very front of the plane, you will find EVA Air’s fantastic business class product aka “Royal Laurel” Business Class. The seat, service and amenities provided are top-notch and I would argue, it provides a better flight experience than some other airlines’ first-class products. 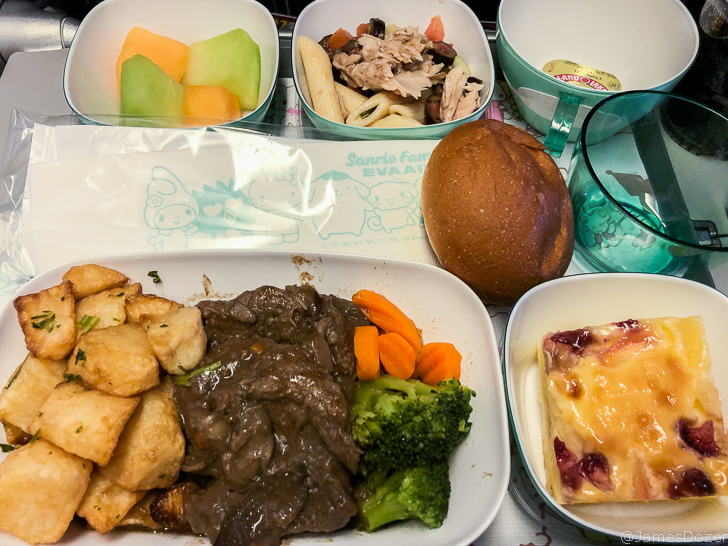 You can read my full review of EVA Air’s Business Class from Taipei to Los Angeles by clicking here. Behind business class, there is a small premium economy class section with just 64 seats. This is a true premium economy product with upgraded seats and amenities. There are 8 rows of seats in a 2-4-2 layout. Aft of the premium economy class cabin, you will find two economy class cabins with 211 seats in a spacious 3-3-3 layout. Each seat measures 18.3 inches in width, 33 inches in pitch and approximately 6 inches in recline. You would be hard-pressed to find another economy class product offering this much space. On this flight, I was seated in 57A, a window seat located on the left side of the aircraft. Waiting at my seat were a pillow, blanket and a set of earbuds. Hello Kitty branded sanitary bags and wet wipes were also provided. In my opinion, seats 57A, 57C, 57H and 57K are the best economy class seats. These seats have the advantage of being one of the few “two-seaters” in economy class. There is plenty of space behind the seats and along the aisle seat and it’s perfect for couples traveling together. There’s also extra under-seat storage and you get two sets of windows. And the best part, there is a wall behind your seat. You can store things back here and still fully recline your seat without having the annoyance of another passenger pulling on the back of your seat. However, the one downside to these seats is that they are right in front of the lavatory and people do congregate in this area to stretch their legs and socialize. Each seat is configured with a personal entertainment monitor, USB port, coat hook, reading lamp and an adjustable headrest. However, footrests and universal electrical outlets are not provided at every seat, which I think is a miss here. Entertainment-wise, the EVA Air Panasonic system was loaded with an acceptable selection of new Hollywood, European and Asian movies, TV shows, video games and musical entertainment. There were 12 new Hollywood movies and a handful of older movies. WiFi was provided on this flight and it was decently priced. As I settled into my seat, the flight attendant came by to welcome me onboard and provided me with printed Hello Kitty menu. About 15 minutes later, the doors were closed and we pushed back from the gate. It was such a gloomy day to be flying but it turned out beautifully once we climbed above the clouds. Once we reached our cruising altitude, the flight attendants came by with two rounds of drinks and a packaged Hello Kitty snack packet. Lunch was then served about two hours after departure. I chose the beef stew, which was served with a side of potatoes; a fruit cup, pasta salad, bread roll and dessert. It didn’t picture well but the beef stew was actually really tasty. The beef was tender and the sauce was really flavorful. During the meal, the flight attendants came by several times to refill drinks and check on passengers. Both alcoholic and non-alcoholic beverages were provided complimentary. After my tray was cleared away, I went to the lavatory to freshen up. The lavatories were standard size but quality amenities were provided to make your flight more enjoyable. Escents branded Hello Kitty lotion, facial mist, aroma mist and hand soap were provided along with eyeshades, earplugs and dental kits. Once I got back to my seat, I did a little bit of work on my laptop and then zoned out with a mindless action movie. Comfort-wise, these seats were really nice. They were comfortable, well-padded and offered a deep recline. The cabin was kept a little warm at first but then cooled off perfectly a couple of hours later and I was able to doze off for a few hours. Not bad for a daytime flight. In between meals, water, juice and some packaged snacks were made available in the rear galley. Service-wise, the flight attendants were great. They were friendly and walked the cabin frequently during flight with beverage trays and other snacks. About two hours prior to our arrival into Taipei, a full lunch was served. I chose the Chinese option, which was congee. It was served with a side of fruit and some tofu. If you like congee, you will like this. Also, how adorable are these utensils? Overall, this was another enjoyable flight experience with EVA Air Economy Class. EVA Air is not perfect by any means but I think they have a stellar economy class product. The seats are spacious and comfortable. The food is delicious and the service is attentive and personable. I love the amenities provided onboard and the Hello Kitty service is enjoyable for both fans and non-fans. Have you flown EVA Air Economy Class? If so, please share your thoughts with us in the comments section below. Thanks for reading!